Swizec Teller published on August 7, 2015 in Front End, Technical. A client recently asked me for a shiny graph. They had an API that spits out a lot of data, and they wanted an interactive visualization that would help users make decisions. Deadline was tight, technology restrictions were “As long as it works”, and specs were loose. “A-ha!”, I thought, “This is a job for React+d3.js!”. Small, well-contained, perfect. The best kind of project for testing new technologies. It sounded a lot like gems for Ruby on Rails. Tiny packages that work as self-contained apps designed to be integrated into larger projects. A team of engineers isn’t going to rewrite their whole project into React, just so you can make a small component. I wasn’t going to ask, and they wouldn’t have done it. I would have to accommodate them. Well, at the end of the day it’s still just a website. There’s a modern browser, HTML, the DOM model, CSS, all the basics. And you don’t need any of that stuff anyway. Not on the deploy side. Not on the user side. You only need that stuff when you’re developing. Once Webpack is done compiling your code, you’ve got run of the mill present-day ES5 that runs in any mostly modern browser. I’ll tell you more about Webpack later, keep reading. Yes, there’s some overhead with loading the whole React library for just one component. But it’s only 38KB after minifying and compressing. jQuery is 29KB and nobody bats an eye. Besides, if you’re using a public CDN, many users well have React cached already. That makes it a 400 byte download to confirm you’ve got a good version. Not bad at all. But I don’t think global functions are the best way to go about integrating a React component. They mess with the global namespace, and they can only do one-way one-time communication. Once you invoke a component, it’s left to do own thing, and you have no insight. We can package React components as jQuery plugins. Yes, we could make Backbone views, yes, we could make Angular components, yes this is an affront to sensible architecture. And it’s perfect anyway. Name one website or web app built in the last 10 odd years that doesn’t have jQuery? Name one web developer who can’t help themselves with a jQuery plugin? You’re looking at a component that tells you how many times you’ve clicked on The Button. That’s it. Nothing fancy. The rest is a normal old school web app. There’s some jQuery to render the component, and two jQuery buttons to interact with the component once it’s rendered. The jQuery-driven white buttons can both read and write the component’s internal state. They need no React to do so. To whomever implements them, they just look like jQuery code. Nice and easy – select element, call jQuery plugin. Bam. We select an element, get its instance of the plugin, and call val() with or without an argument. Depending on what we need. We’re doing .clickCounter() because I didn’t know how to properly turn the plugin into a per-element singleton. Getting the reference was easy enough, but jQuery selectors can return arrays and that means I have to return an array as well. But then the .val() function gets confused, which is why we have to access a single element of the returned array. Good enough for now. Anyone who knows how to use jQuery can use our React component. And they don’t even need React. To turn our React component into a jQuery plugin, we’ll have to take care of two things: making the plugin, and compiling our code for the real world. We’ll take care of the plugin first. I like to put this code in a src/main.jsx file. It serves as an entry point for the component and exports everything the outside world needs. 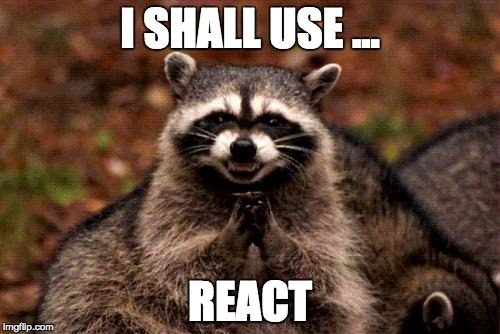 When somebody wants to use my component from React, they can require the component directly. Anyone who’s got a dependency loader, but isn’t using React, can require our component, then call a function to render it inside a particular element. Anyone without a dependency loader, can use the global function. The base for our jQuery plugin comes straight off the jQuery boilerplate project. Whew, that’s a lot of code. We’re only making a plugin if jQuery is available, and we’re wrapping its definition in a closure so that we can share the pluginName and defaults variables. Then we’re defining a constructor function called Plugin, which stores some basic properties in the newly constructed object, and calls init. Inside init, we render our React component. We didn’t have to use document.querySelectorAll, because this.element already refers to the target DOM element. If val doesn’t get an argument, it will return the component’s current state. Also notice that React was nice enough to let us access our component’s internal state with this.component.state.counter. No React incantation required, just some knowledge of where components store state. This will let us call $(...).clickCounter(). And because it saves each instance of the plugin in each element’s $.data collection, we can make sure to treat each instance as a per-element singleton. Every time somebody calls clickCounter on an element, they will get the same object. Which is neat when you want to mess around with components’ internal values. With this, we tell Webpack that the entry point for our module is ./src/main.jsx. That’s where we put the plugin code. Using externals, we explained that both React and jQuery are external dependencies. This way Webpack won’t try to bundle them into the compiled file. It might make sense in some cases to bundle both of those into the same file, but we lose the benefit of serving from CDNs and the users’s browser cache. There you go, a React component packaged as a jQuery plugin. For when you don’t have the time or the budget to commit to a full rewrite. You write the component as you always would, make a thin jQuery wrapper, and make sure people outside the ecosystem can include your file. Bam. You can find the whole example code on Github, here.